We started farming by raising chickens. Homer knew they could taste much better than what was available in the stores. His mother had kept chickens and he remembered a fresh taste, that organic grocery store chicken was not achieving. Then we had to have eggs too. And Thanksgiving turkey. And beef. Then pork. All along we had vegetables here and there. A cold frame full, made from a couple of old windows. A patch of peas, beans. Now, here, we have a whole bunch of vegetables growing year round. In the winter we tend to cook all we grow, as we need the warmth. Last night we handed out a predistribution, an early set of vegetables. The asparagus needed cutting, and then spinach looked like it might bolt, and radishes ready...and before we knew it, a box full of good stuff was ready! After all was done, we had a lovely, crispy salad that included everything from the box. While there is still a chill in the air it.has become warm enough that a salad is delish. 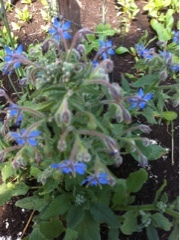 The borage flowers? Yup, ate those too.